The ballet based on E.T.A. Hoffmann’s story Der Sandmann, Coppelia was premiered in Paris on 25th May 1870 with original choreography by Louis Merante and A Saint-Leon, the latter who also wrote the libretto with C. Nutter. The music was especially composed for the ballet by Leo Delibes. The story focuses around Dr Coppelius, a mechanical doll-maker and his fascination for his favourite doll Coppelia and the romance between Swanilda and Franz. Franz blows kisses to the doll thinking she is alive. The jealous Swanilda and her friends, finding a key that Dr. Coppelius has dropped enter his house and are surrounded by the fascinating mechanical puppets. 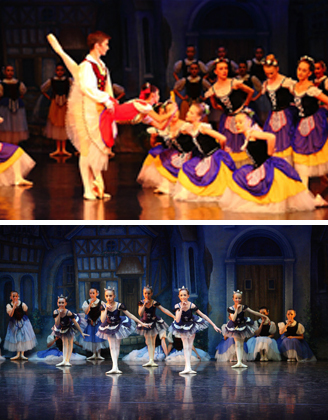 Swanilda changes places with the Coppelia and tricks Dr. Coppelius into thinking his beautiful doll has come to life. Franz breaks into the workshop in search of Coppelia and is eventually reunited with Swanilda. The villagers celebrate the marriage of the couple and hold a festival for the renewal of the old church bell. Dr Copplius is financially compensated for his broken dolls. A talented young Italian ballerina Giuseppina Bozzacchi who went to Paris to study created the role of Swanilda. Sadly she only danced the role 18 times before she died of fever on her 17th birthday during the German siege. English Youth Ballet has adapted this three act ballet to accommodate the large cast by adding four extra pieces of music taken from the ballet Sylvia composed also by Delibes. The Coppelia Doll Dance, the Night Hours in Act 3 and the Soldier Dolls from Act 2 have new dances that are unique to EYB’s production.